Odisha’s Manoj Kumar Maharana has just broken a Guinness World Records title that stood unbeaten for 8 years. The 23-year-old achieved the Most straws stuffed in the mouth (hands off), cramming 459 drinking straws into his mouth at once! 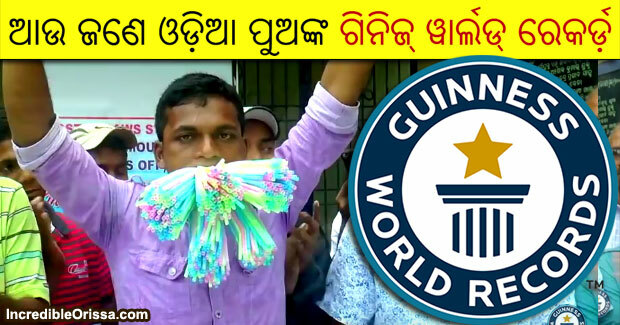 In order to break the record, Manoj needed to make sure all of the straws were fully in his mouth and remained there for at least 10 seconds without falling. The rules for this title state that the challenger cannot use their hands to support the straws during this 10-second period, but they are permitted to put elastic bands around the plastic tubes to hold them together. Manoj has wanted to achieve a Guinness World Records title ever since he was a child, but he was really inspired to attempt a record after hearing about the previous record holder, Simon Elmore. The Brit managed to stuff 400 straws in his mouth at the Mark ‘n’ Simon Show in Germany. Another variation on this record challenge is Most straws stuffed in the mouth (with hands). Challengers for this title are able to fit more straws in their mouths because they are allowed to use their hands to hold them. Guinness Rishi from India achieved a total of 496 on the set of Guinness World Records – Ab India Todega in Mumbai. The dedicated record breaker had all his teeth removed so that he could cram more straws in his mouth.